These vibrant, low-calorie prawn kebabs are served with delicious minty houmous, tahini and garlic yogurt. Heat the olive oil in a pan with the cumin seeds and toast for a few mins until aromatic. Tip in the carrots, season, then cook for 3 mins until tender. Transfer to a bowl, then pour over the couscous and 400ml hot water. Cover with cling film and leave for 10 mins, or until all the water has been absorbed and the couscous is tender. Meanwhile, heat the grill to high. Put the prawns, cherry tomatoes and onion wedges in another bowl, season, then stir in the harissa. 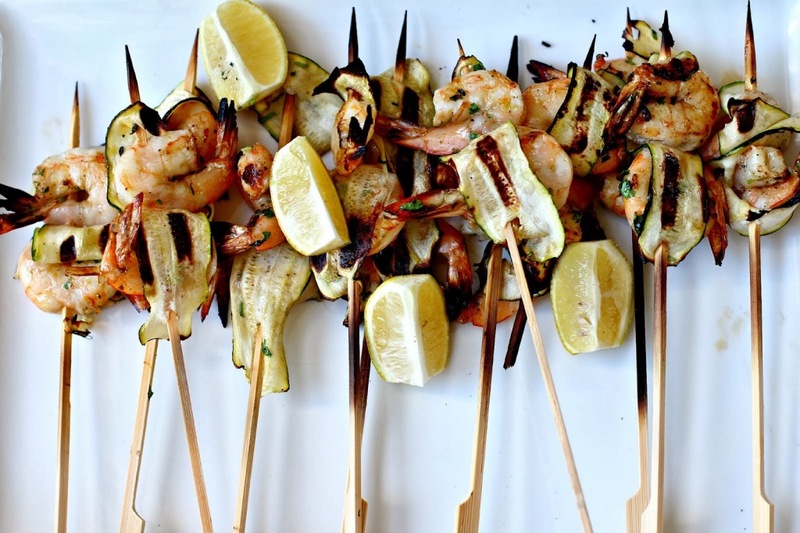 Thread everything onto skewers (if using wooden skewers, soak them in water first to prevent burning), then lay on a baking tray. Grill for 2-3 mins each side, or until the prawns are cooked though. Mix the tahini, yogurt, garlic, lemon juice and seasoning to make a sauce. Fork the mint though the couscous, transfer to a platter and place the skewers on top. Drizzle over any cooking juices, and serve with a dollop of sauce and lemon wedges.